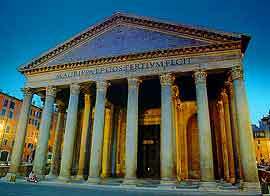 Rome attraction-guides.com - Rome, Italy attractions guide Rome Pantheon Monument information about attractions, open hours, admission charges, classical ancient architecture, history, rebuilt by Emperor Hadrian, gilded, church, baldachin, location and address, tel / telephone number, general tourist information about Pantheon in Rome (Roma) area, Italy (Italia) IT - Last updated 30/10/2012. Built in 27 BC, Rome's magnificent Pantheon is a truly splendid example of classical ancient architecture in Rome and the Pantheon is considered to be the best preserved monument of Imperial Rome. In the 2nd century, Rome's Pantheon was completely rebuilt by the Emperor Hadrian and the Pantheon was actually a church during the Middle Ages. The dome used on Rome's Pantheon was once gilded and it is believed that this gold was pilfered to gild the baldachin that stands over the altar in Rome's St. Peter's church.